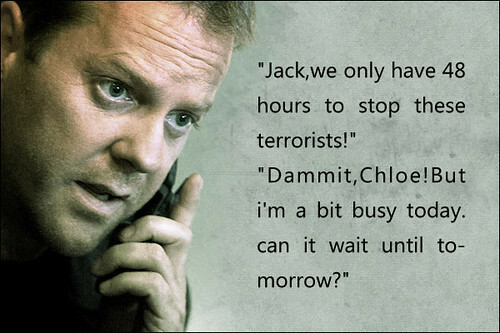 Jack Bauer was clearly a Boy Scout, once upon a time. The Counter Terrorist Unit agent stands as an example for what every man should be: prepared. Not everyone will use these gadgets to save the country, but the well-prepared man can still save the day. Jack Bauer’s duties as a CTU agent tasked with saving the country carry him around the world, which makes a satellite phone like the Iridium 9575 Extreme indispensible. The Iridium offers coverage virtually everywhere on the planet, including the polar regions, ensuring that calls always go through. The phone also has a GPS-enabled SOS function. Kind of pointless to have all the toys in the world if you can’t carry them all, right? Much like Batman’s utility belt, Jack Bauer’s messenger bag carries a tool to meet every occasion. Bauer’s too stylish for a backpack, but this messenger bag, available on Amazon, complements the stylish agent perfectly. Best of all, all the tools of the trade sit at the waist, where they will be easily accessible. When you only have 24 hours to avert disaster, a good watch proves to be invaluable. Jack Bauer tells time the tactical way with the MTM Black Hawk Special Ops Watch. The Black Hawk was designed for actual spec-ops use so it can withstand incredible amounts of abuse. The watch also boasts a special display that lights up for viewing without alerting would-be observers, as well as a beacon function that can be viewed from up to a mile away. Get the watch straight from the manufacturer here. The well-prepared man knows that a knife always comes in handy. Jack Bauer uses his to cut through restraints and threaten enemy agents, but the uses for a simple pocket knife are endless. You might use yours to open the mail or simply to trim a loose thread from your shirt, but you’re certain to look like you mean business if you have the Microtech LUDT favored by Bauer. Jack’s knife is black, presumably for stealth purposes, but the handy automatic comes in a variety of styles. Jack has to do his fair bit of spying on the show, and he uses the Brunton Echo 7×18 Pocket Scope to keep tabs on the bad guys. The scope measures just 1.3×3.3 inches and weighs 1.8 ounces, making it tiny enough to carry in a pocket. Don’t let the size fool you, this scope boasts powerful magnification. The Echo features a 181 foot field of view at 1,000 yards. Great for observing a terrorist cell or merely to watch some birds. Being prepared for any situation, even if you don’t find yourself in the kind of bind Jack Bauer deals with, just makes sense. You may never need one of these tools to save your life, but they’re sure to save you some time and energy.